We are very grateful to the Lord for the time we had together in the pastors’ conference and the missions team visit. The Lord met our expectations – it was a season that our faith has been strengthened, care has been brought to us as pastors and to our congregations through the missions team visit. One of the highlights that stood in my heart is on doing the work of an evangelist, as Paul was charging Timothy to preach the word in season and out of season. The different sessions we had were unique each one of them. What Apostle Joe Kayo taught on thanksgiving was very timely; just as the Bible says about the last days, that people will be unthankful. 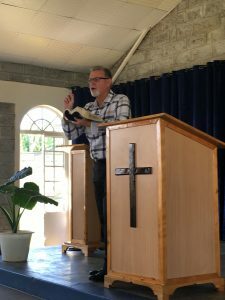 It is the same teaching that pastor Jeff taught the last day in Nairobi. We have a lot to thank God for. One of the pastors that we had invited from Nairobi was very much touched by the truths that he had learned in the conference. In the last day, he sat with me and asked me how long I have been hearing these kind of teachings, and I told him for 13 years. He told me that I am blessed because for him it was the first time to hear some of these truths expounded. Pastor Scott, these truths are rare in many pastors conferences and churches in this nation. Many conferences concentrate on how to be big, how to have a big following. It really ministered to me as you answered one pastor who asked whether he can continue shepherding a congregation of 15 people. It was a great answer because you handled a lot in our hearts, that what the Lord is looking for is faithfulness and that our goal should be to hear, “well done good and faithful servant,” when we shall stand before Him. The people of God were very excited to see you and to hear from you; to some of them it was their first time to see you. What stood out to me in this visit is to see your life and the practical aspect of the next generation, to see your daughter Kimberly and granddaughter Hope, following the Lord , this IS what I desire to see in my children and the people of God here in Kwa Njenga. I was travelling in a bus last Friday headed to the city, (it’s a distance of about 16 km). When there is traffic, it can take almost 1 hour. When I was in the bus, I requested the conductor to allow me preach in the bus, which he allowed me to do. I taught on marriage from Malachi, that the Lord hates putting away (divorce). I saw a very good response; about 80 percent of the passengers were very interested to hear the message. When I was finishing to preach, I said that if anyone would have a question he can visit us in the church or call my phone number. After I alighted from the bus, two people called expressing an interest to meet me. I sense a need to teach on marriage wherever the Lord may guide. I think teachings on marriage are very rare and that’s why many marriages are breaking in this hour. I am thinking of having an outreach of a different kind, something that we have not done. We will invite our neighbors who are in marriage to teach them on marriage, and to share the gospel with them. Thanks Mtume for coming together with Pastor Ron and sending the missions team to come and minister to us. This entry was posted in Calvary Temple Missions, Church Missions on June 29, 2017 by Pastor Forbe Carlson. The Lord is good and His hand great, He has been my shield and my buckler, He has made me glad, His love and His mercy have sustained me; there is no place like in His presence, for there is fullness of joy. I am standing on His promises. I was listening to a teaching yesterday by David Wilkerson, on the prodigal son and he shares that the son’s concept of the father being a hard father, and he did not think that his father would have him back as a son; he was feeling alienated, yet the alienation was self afflicting, and when he came back home his father received him, and he was to go and enter in to eat and rejoice and dance. Pastor Wilkerson said that many Christians never enter in that fullness of feeling accepted fully by the Father all because of unbelief. They never enter the rest. They feel like as if there’s one more thing that they need to do so as to feel received and accepted, yet the door is open through Jesus Christ, and it is by grace that we are saved. And I just felt the Lord minister to me yesterday and I was able to regain back my rest in God and that assurance of his love. We had a great service today, Joseph taught the first session on Discipleship, and I taught the second session on body ministry from Ephesians chapter 4, and also how to relate with one another in the body of christ. 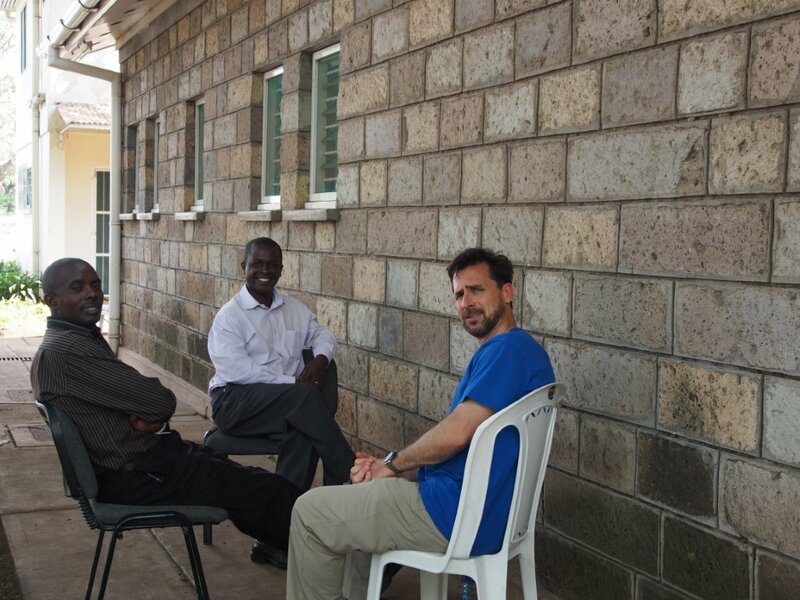 We had a great time last week with pastors Zadok and Francis coming over to Nairobi. I spent a lot of time with pastor Zadock, starting from our meeting in pastor Rob’s house, and later in my house and in some other meetings. 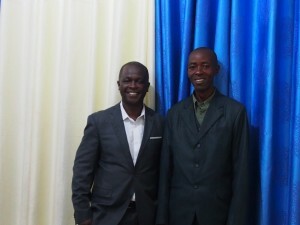 It was my first time to have such an ample time with him; though we meet in the pastor’s conference, this was special. 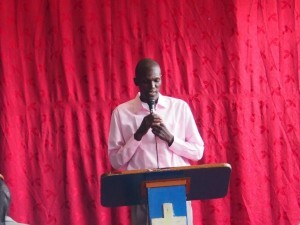 He loves the Lord, is very serious in the things of God, and he had a chance to preach in the Kwa Njenga Church. He brought a good word on reaching out to the lost; later in that day we had a deacons’ meeting together with the captains and he was able to see that part of having a leadership group that bears the burden of the ministry with the pastor. He also shared very good things of what has happened to the flock that he shepherds in Usenge. Some of it was from the last year’s conference in raising the standards and requiring obedience to God’s Word. He shared how much growth has come upon the flock there. Another thing we sensed was the benefit of the ministry that has come to Zadock through Pastor Rob’s visits and how close that Zadok feels he is to the ministry, it has had a great impact on him. He also attended the young adults’ meeting before he left. I saw there would be great benefits if the pastors’ relationships and friendships were strong other than having just a formal relationship. I have also had a chance to visit Sammy of Kwa Njiku. I arrived in his house at 8 pm, and we had good fellowship with him, plus his deacon called Billy and his wife Jane. The deacon shared how he joined the fellowship with his wife and I shared how I also joined the fellowship. He and his wife are a great encouragement to Sammy. After they left, I was left with Sammy and his wife. It was a relaxed casual time, this was my first time to sit and share with Sammy’s wife. She seemed to me as one that loves the Lord, and had a very lively testimony on staying alert and being watchful for the Lord’s return. She painfully shared how this generation of Christian has lost deepness in the things of God, and unless the lord intervenes there is no hope for the next generation getting deep because all that they have seen is lukewarmness. Later we had a great time of praying together and they escorted me to the road @ 3 am, for I was to travel with the first bus to Nairobi. We have started a new disciples’ class. It is a class we usually start based on need when we have a number of new disciples that have joined us. The class helps to establish them in the faith and even where their questions can be answered. The deacons are doing well; we will in the near future need another deacon because the flock is growing and and it will take more than 2 deacons to serve so that no one is neglected. 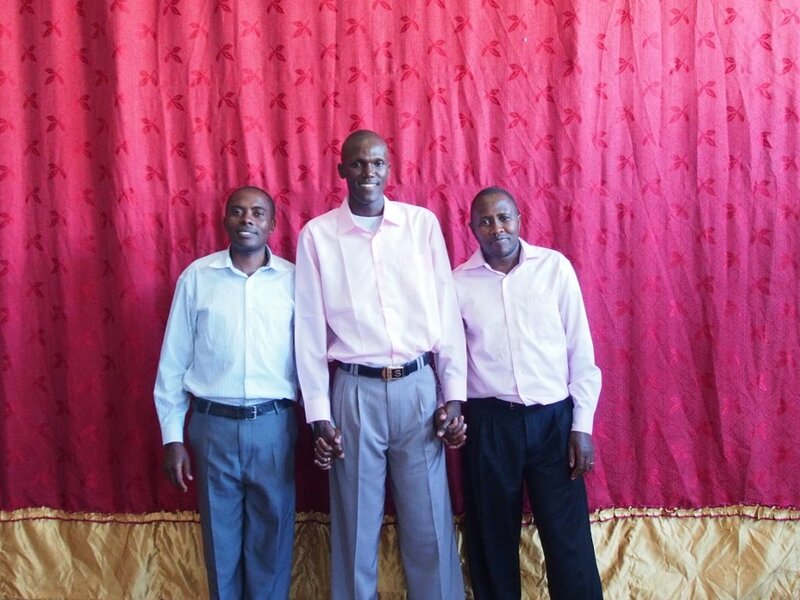 This entry was posted in Calvary Temple Missions and tagged Calvary Temple Missions, Calvary Temple Sterling VA, Kenya Missions on October 9, 2015 by Pastor Forbe Carlson. 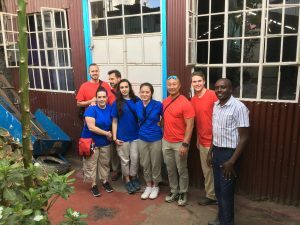 On May 19th, a Calvary Temple mission team arrived at Nairobi’s Jomo Kenyatta International Airport. The team consisted of 15 Members, including 3 Senior students set to graduate in June. 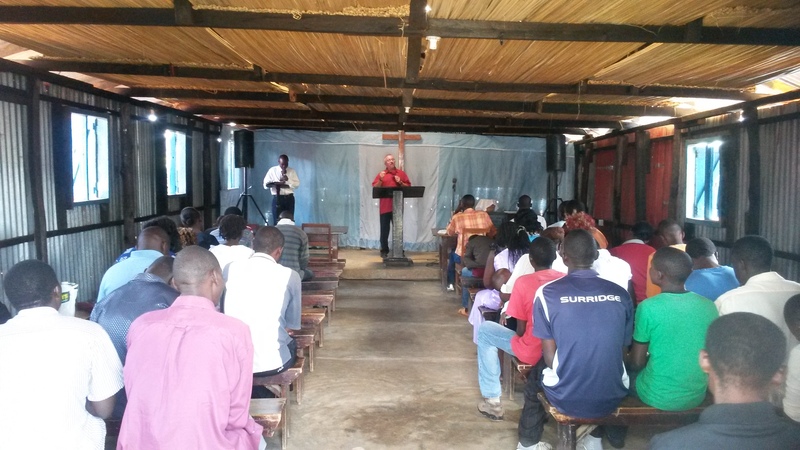 The team began their ministry in Nairobi with the Umoja and Kwa Njenga churches. 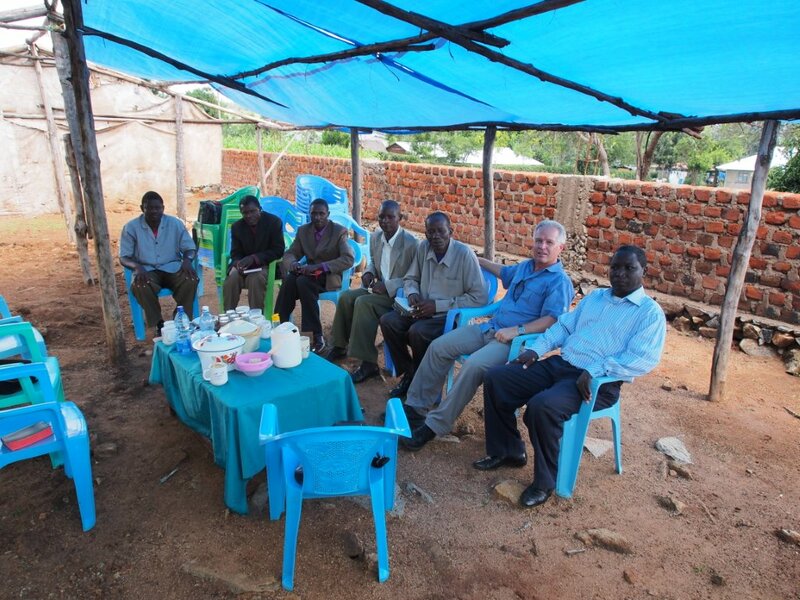 Besides the ministry of the overall team, Pastor Jeff met with the pastors of the churches, like he normally does in each church where the team ministers. The ministry in Nairobi went very well, one of the highlights being one day in worship where the Lord came down in a mighty way. Group picture of team with the Kakamega and Eldoret churches. 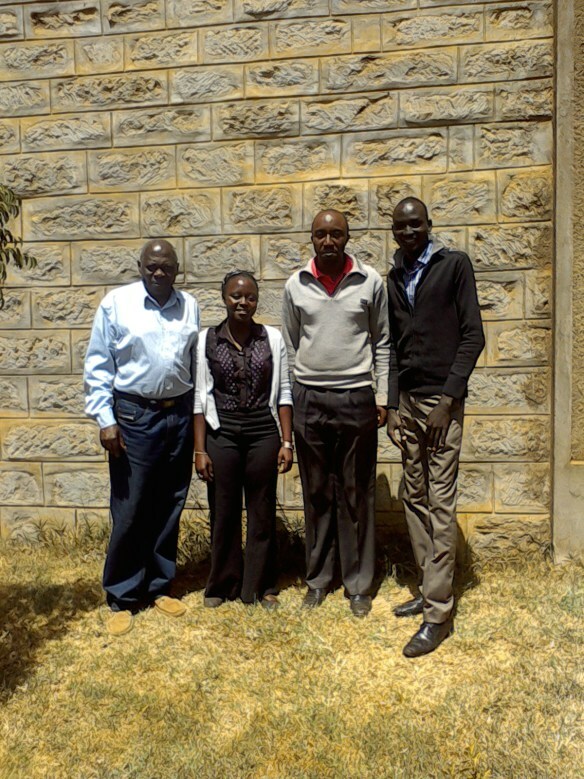 From Nairobi, the team went to Eldoret. 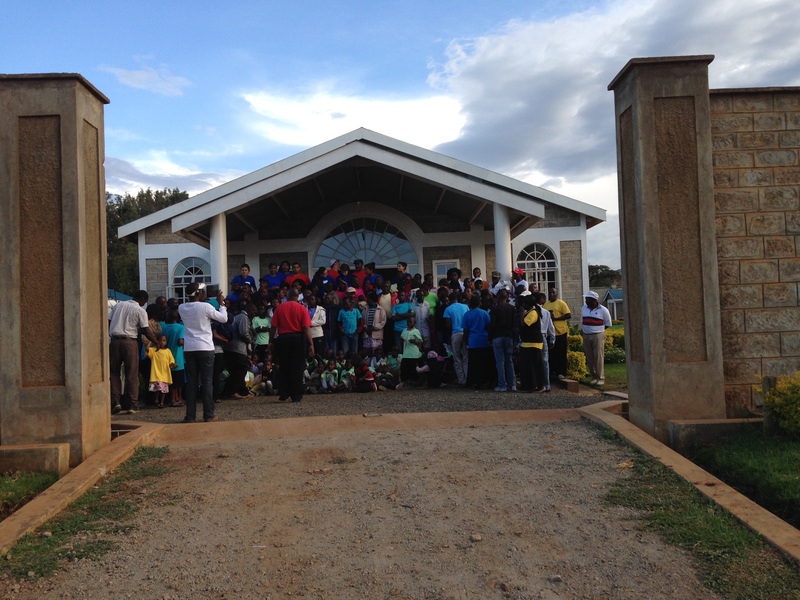 There, the Eldoret church was joined by our family from the Kakamega church. 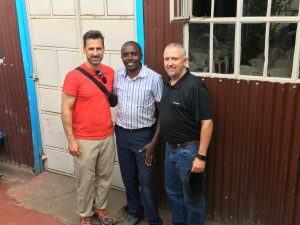 There was great ministry to both churches, and included an afternoon of outreach in the Pioneer community where the Eldoret church building is located. 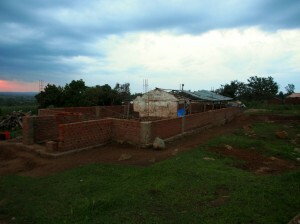 Panoramic view of the Nakuru church plot and buildings. The final outreach for the mission team was in our Nakuru church. This infant work was encouraged and challenged by the visit of this year’s team. 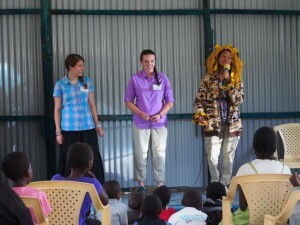 The team that came to Kenya to minister this year was a tremendous blessing. We believe that the Lord ordered their steps, sending each member with relevant ministry to all of our churches. We purpose to build upon what the Lord gave us through them. This entry was posted in Calvary Temple Missions and tagged Calvary Temple Missions, Calvary Temple Sterling VA, Calvary Temple VA on August 1, 2015 by Pastor Forbe Carlson. This past week after a pastors’ meeting in Nakuru, we traveled to our Mabera church to be with Pastor Jonathan and his flock. Mabera is near the border of Tazania. Not too far from where the Taragwiti church was located. Jonathan is a man of God with a shepherd’s heart for the flock. He is in his 60’s but has the Caleb spirit. He originally came from Tanzania where he had been a pastor to start a work in Kenya. This is actually the first time we have ever taken a mission to the Mabera church. The other times we would stop there on the way to Taragwiti. We were blessed by the love of God reflected in Jonathan and his wife. They were so thankful for all the ministry brought to them. We were there Friday to Sunday. There was a good response from the flock all the services. 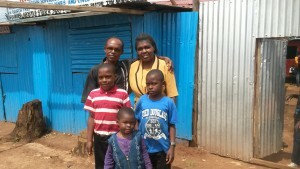 We also brought Anthony and Beatrice from the Umoja church to help in the ministry. They were a blessing and helpful in interpreting and teaching the children. I taught on the grace of God and the gift of Salvation. Then on Sunday the Lord changed course in the first service and I taught on deliverance from fear and the Lord came down and we saw many delivered. Then in the main service I taught out of 2 Cor.8.2, how the Macedonian church out of great poverty abounded in liberality of giving (an amazing verse) and the story of the widow that God used to provide for Elijah (and also provide for the widow). We took time Sunday afternoon for testimonies. It was a blessing to hear the testimonies of what the Lord had done. Also good testimonies of healings over the years. One young lady who was being persecuted by her family shared how years ago she had been sick and been to many doctors and no help. But then she shared how when she came to the church how God had healed her and now this was her church and she wasn’t going anywhere. It was a blessing to see Jonathan stand on divine healing and refreshing and convicting. It was a blessing to hear Mildred, Anthony and Beatrice all share how blessed they were by the joy, thankfulness and hunger of the people. Also to see how much the flock loves their pastor. We were able to encourage Jonathan on strengthening their ministry to the children. Also you would like to see more men in the church, several women with unsaved husbands. I really challenged them in winning their husbands through Christlikeness. It had been over a year since we had last been to Mabera and seen the construction. All that had been done last year was just the bathroom and so they had made good progress in a year. 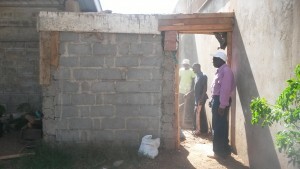 A couple of months ago, the church lost a great number of bricks that were going to be used in their building project. Jonathan said finding the same size bricks that they are using might be a challenge because they are larger than the standard size. They had done this so they would not have to have as many rows of bricks. At the end of the service I was able to share of Pastor Scott’s heart being touched for their loss of the 6,000 bricks and his desire to bless them. Their response was humble thanksgiving that he would think of them in their need. It was a blessing to show how God’s grace was manifested through their need. On Saturday morning we had a pastor’s meeting with three of the pastors from Tanzania and also Pastor Joash from Monianku and Pharez from Isbania. It was a blessing that Joash was able to come. He recently had a sugar cane tractor that crashed into his church, so I have been trying to help him in dealing with the factory and compensation for damage, but it is a real challenge in trying to get money from them. In our time with the pastors we were dealing with their marriages. 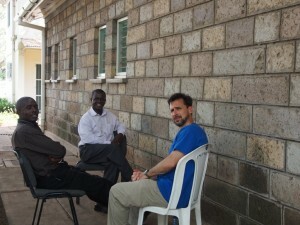 It was helpful getting more time with the Tanzanian pastors since we don’t know them that well. Jonathan has been helpful in dealing with them. It gave a much clearer picture of who they are and our relationship to them. Finally just very thankful for this trip and to see a good representation of our mission here in Africa. Over the past year there is no pastor who has called more for counsel than Jonathan. Though he is one of the oldest of our pastors he is teachable and easy to guide. Even in going to Anthony and Beatrice his heart was, “tell me what we can do better.” The other thing that blessed me was the joy and love in his marriage. 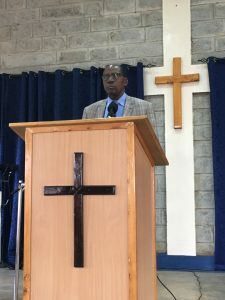 This entry was posted in Calvary Temple Missions, Church Missions and tagged Calvary Temple Missions, Calvary Temple Sterling VA, Kenya Missions on June 29, 2015 by Pastor Forbe Carlson. 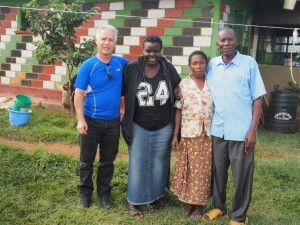 On April 26th, Ruth and I went to visit our church in Kakamega. It had been awhile since we had been there, and we wanted to see and encourage the people. The Kakamega church has been a new location for about a year and a half. This is the first time that they have had to pay rent, so things are still difficult for them. The people seemed to be content and at peace. The last time we had been to Kakamega, there was some strife that Pastor Tom Munala had been dealing with. Since that time, some people have left and some people have had their love for one another renewed. This was the most “at peace” that I remember the church being. The worship was very good, the people were on time, and they were attentive to the teaching of the Word of God. I taught in the first service about renewing our hope, placing our hope in God and in heaven. I reminded them that hope is based on faith – that faith is built on the Word of God and the promises that we find in it. In the second service, I shared about the vapor that our life is here on earth. In the light of eternity, our stay on this earth is very short. It is during this short time that we must learn to follow Jesus, looking for “a city that has foundations, whose Builder and Maker is God.” In the midst of the trials, persecutions, and afflictions, we often have a hard time seeing past this moment. We are to look unto Jesus, the Alpha and the Finisher of our faith. Pastor Tom and his family are doing well. The deacons are in a good place, renewed in the Lord’s vision for their homes and the church. 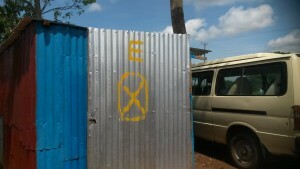 When we arrived at the church plot, we noticed an “X” on the gate. The road that the church is on will be widened soon, and the church will have to relocate further back on their land. It is a small piece of property, and they need favor from their landlord to occupy space behind where they are now. 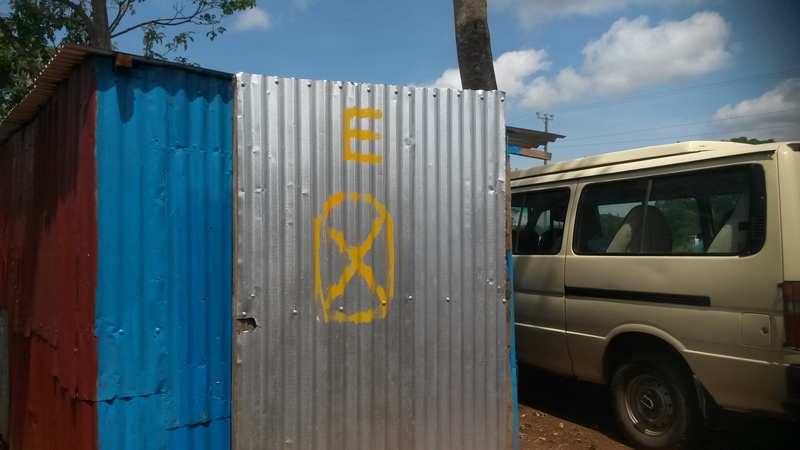 When you remember this “X”, please pray for our family in Kakamega. If so, they will then begin the process of shifting their buildings back. Pray for our brothers and sisters in Kakamega. For wisdom, favor, and strength. This entry was posted in Calvary Temple Missions and tagged Calvary Temple Missions, Calvary Temple Sterling VA, Calvary Temple VA on May 6, 2015 by Pastor Forbe Carlson. 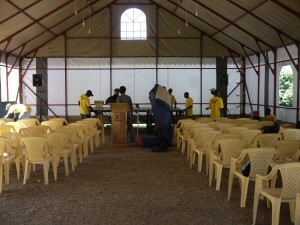 Our Nakuru church has now moved to its new location. In our last post, we shared with you about our need to move and how we began taking down at our previous location. On Easter Sunday afternoon, I went with a team of men from the Eldoret church to begin work on the new church building in Nakuru. 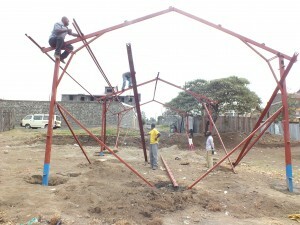 The building frame being erected. Soren Pedersen, a missionary friend from Denmark, had built and erected the basic structure. 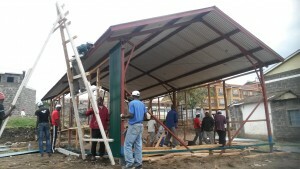 His company, Mechai International, builds these for churches all over Kenya and South Sudan. 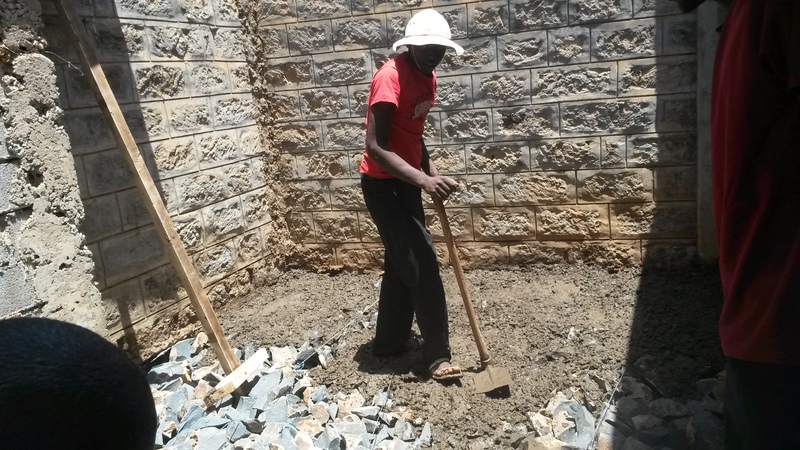 He has built a number of buildings for Calvary Temple, including Eldoret, Murumba, Butula, and now Nakuru. 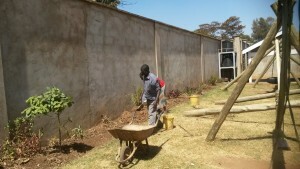 The framing and first installation of the mabati walls. 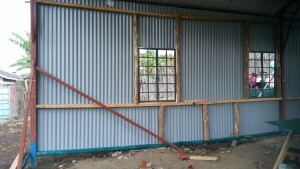 We were going be in Nakuru to frame the walls and install windows and doors. We arrived Sunday evening and began early Monday morning. 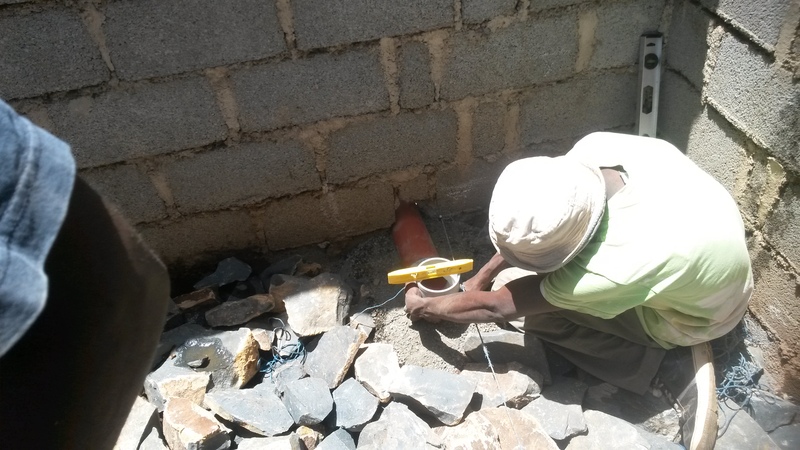 Some of the men began to dig along the foundation (so that the mabati could be aligned at the bottom of the building), some began piecing the wood timbers together, and some began to apply a water/insect proofing solution to the lower pieces of wood. Once these things were done, we began the framing process. Some men ran the horizontal runners, while others installed the windows. I can’t say enough about the men that we took with us from Eldoret. 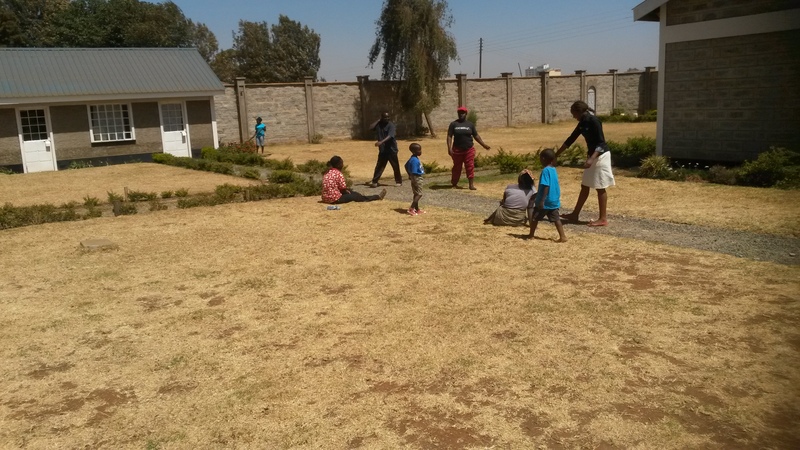 They took their holiday to go with us and minister to the church in Nakuru. It was a great time of fellowship and a real boost to our brothers and sisters there. Though we worked hard and got much accomplished, we only finished about half of the work. Pastors George and Joseph of Nakuru have been working on the building since we left. When it is completed, we will post pictures on this blog. Window installed, surrounded by mabati. 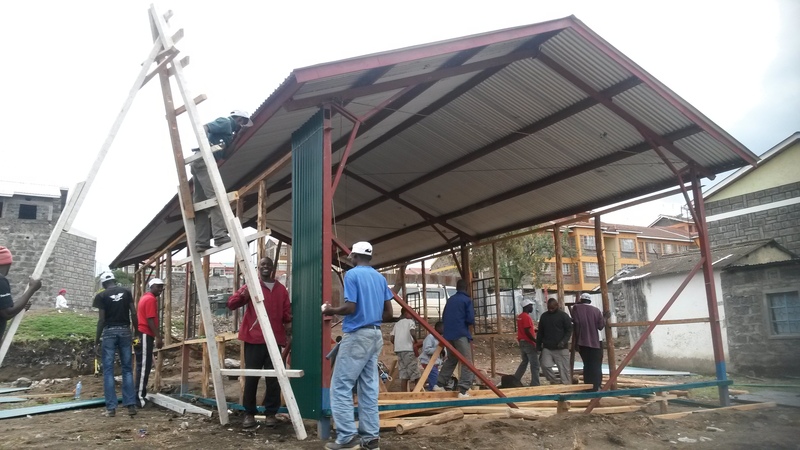 Please continue to pray for our church in Nakuru. They are situated in a very good location, surrounded by many people and a lot of needs. We believe that the harvest is great, and that the Lord has a remnant that He wants us to reach in this city. 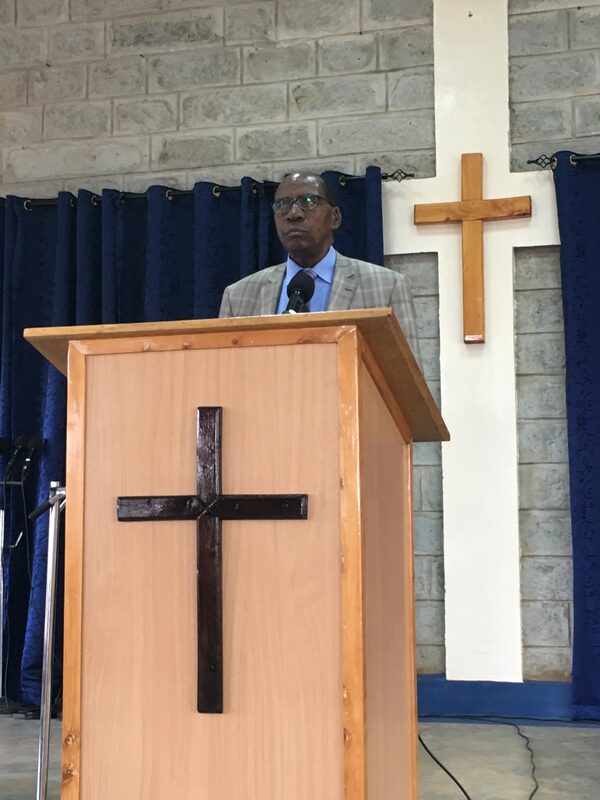 This entry was posted in Calvary Temple Missions and tagged Calvary Temple Missions, Calvary Temple Sterling VA, Kenya Missions on April 16, 2015 by Pastor Forbe Carlson. 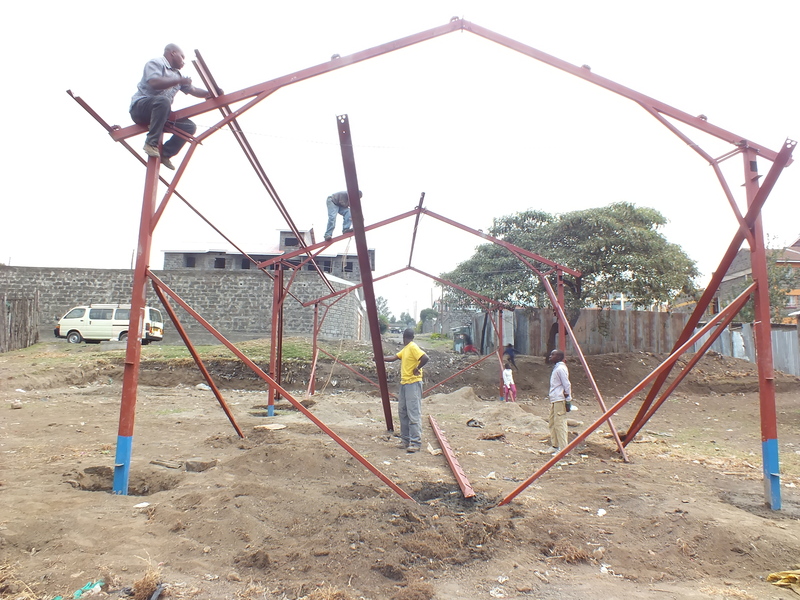 After being in the center of Nakuru for the last 2 1/2 years, our Nakuru church is moving to a new location. 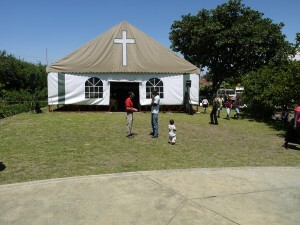 At the first location, the people met in a very large tent. Dave Munsie, carrying cement for the new church building. In April, the people will meet in a different area of the town. It is more residential, and is a place in which we believe that the church can flourish. 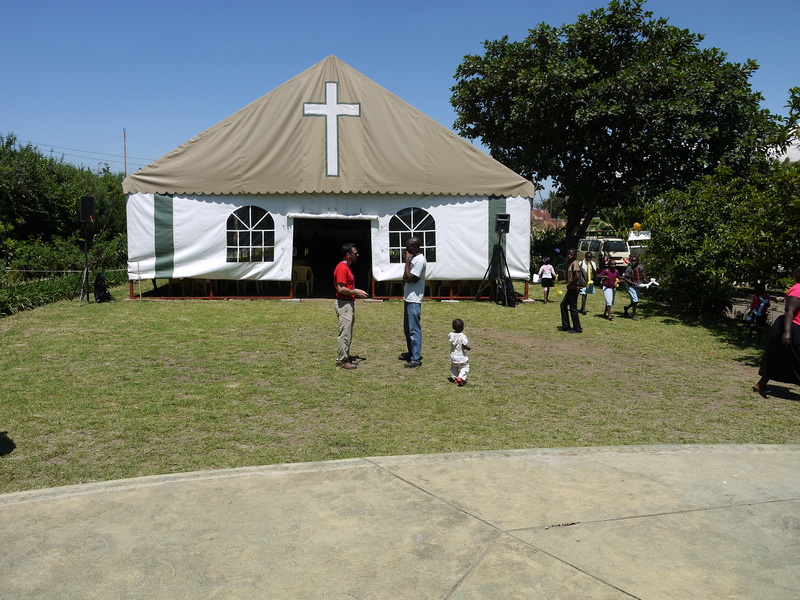 On the 30th of March, Pastor Forbe and a missionary friend (Dave Munsie, from England) went with a large number of volunteers to take down the tent and prepare for moving to the new location. Taking down the tent was a huge endeavor, but we were able to dismantle it in one day. The next day (31st March), the new metal building was delivered to the new lot. 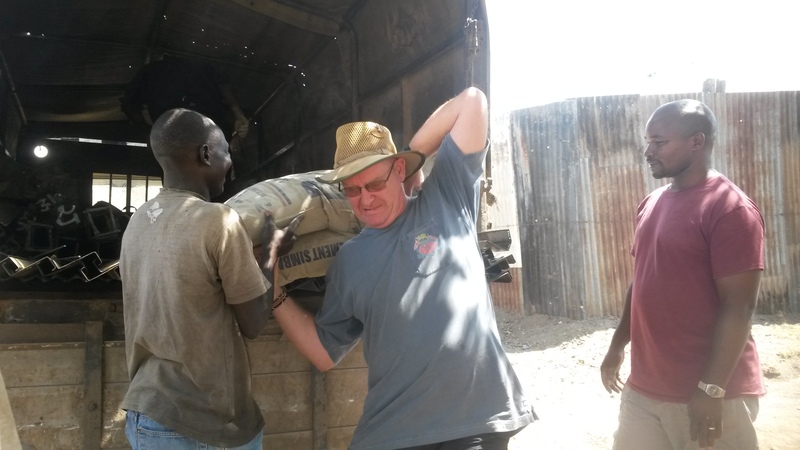 The truck which delivered the building also took the tent back to Eldoret, where it will be stored until needed. We spent the 31st digging footers and painting the metal with a primer, so that the building could be set up on the 1st of April. The moving of locations is underway! We look forward to what the Lord will do in the people as they reach out in this new community! This entry was posted in Calvary Temple Missions and tagged Calvary Temple Missions, Calvary Temple Sterling VA, Kenya Missions on April 4, 2015 by Pastor Forbe Carlson. 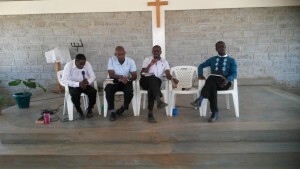 On March 10th, pastors from Uganda, Tanzania, and Kenya came to Eldoret for a pastors conference. On Wednesday the 11th, Pastor Rob Hendrickson and Pastor Forbe Carlson met with our main pastors. That evening, the rest of the pastors arrived. Going into this conference, we felt the need to challenge the pastors on their leadership and how they apply doctrine in their churches. Our pastors have been taught well, but their ability to put the doctrines into practice has been lacking. A couple of days after the conference, Pastor Rob and his wife Mildred were to leave for a trip to Calvary Temple in Sterling, Virginia. 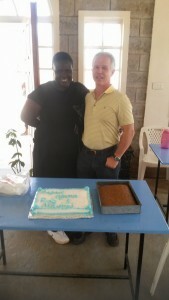 All of the pastors wished them well as we shared a cake in their honor. This entry was posted in Calvary Temple Missions and tagged Calvary Temple Missions, Calvary Temple Sterling VA, Kenya Missions on March 25, 2015 by Pastor Forbe Carlson. 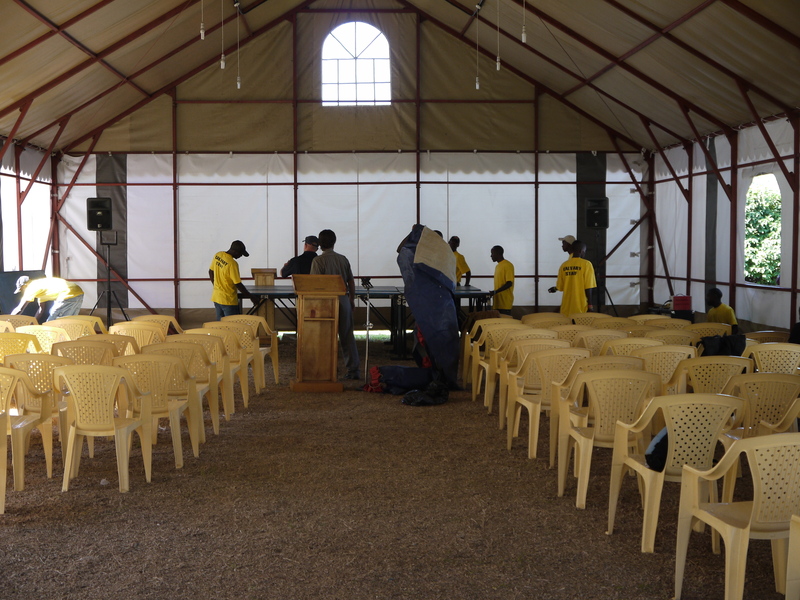 Preparations are underway here in Eldoret for our March pastors’ conference. We hold these conferences three times each year. Pastors from Kenya, Tanzania, and Uganda come together for three days to listen to teaching, fellowship with each other, and learn how to practically apply the teachings that have been taught. Pastors Rob Hendrickson and Forbe Carlson lead these conferences. 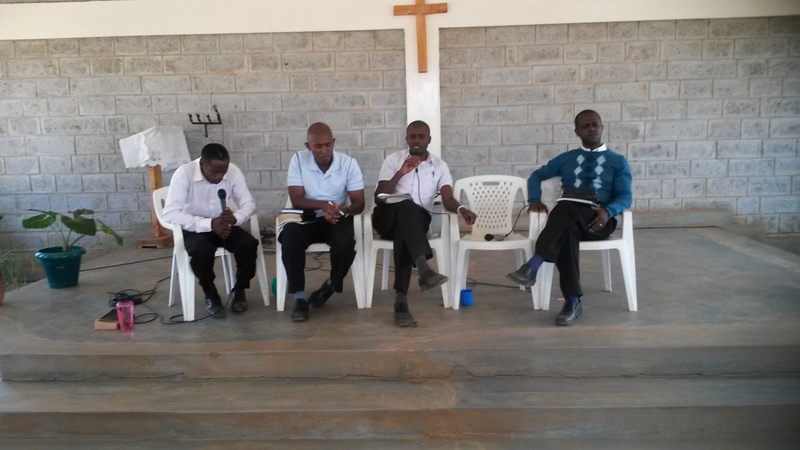 We teach, hold panel discussions, and we answer questions posed to us from the pastors. Some of our main pastors are very helpful during these times. We normally set aside the mornings and/or afternoons for small-group discussions, focusing on the teachings received. The Eldoret church is very busy during this time. As hosts, they serve the pastors with meals, accommodations, and the preparation of hot water for bathing. There are also members who work to give the pastors some recent teachings of Pastor Scott, provide them with transcripts, and do electronic repairs for them. Just before each conference, the Eldoret church has a workday to prepare the grounds for the visiting pastors. They also wash blankets and put mattresses into the sun to air out. This year, another project was undertaken. 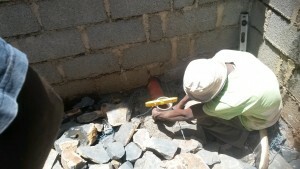 An area in the back of the church property, which had been previously walled off, was given a cement floor and a drain. The pastors will no longer have to stand in the mud to bathe themselves. We are greatly anticipating this conference. Won’t you be praying with us to see the Lord strengthen these pastors? This entry was posted in Calvary Temple Missions on March 2, 2015 by Pastor Forbe Carlson. As the year has begun one of the our prayers has been for open doors of evangelism. How grateful we are to see Father answer our prayers in such a wonderful way. 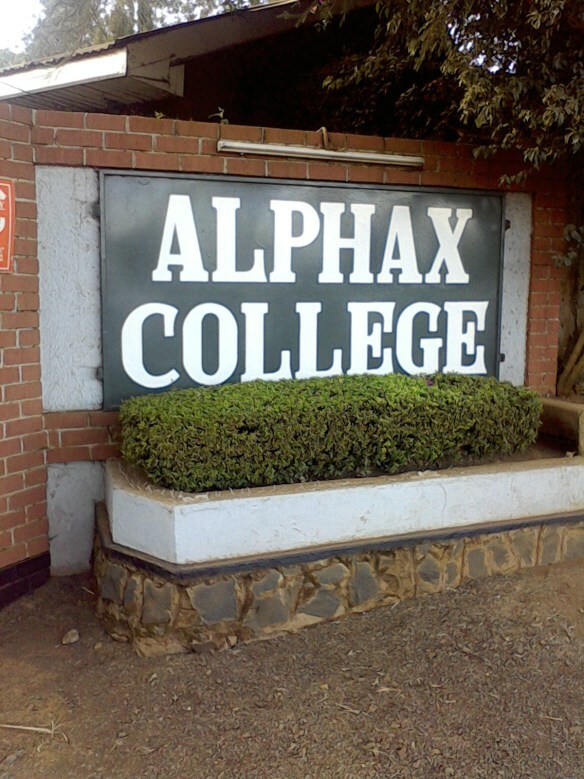 I will say our outreach at Alphax College was the doing of the Lord. Martin, one of our deacons, works as a lecturer in this college and the Lord Has used him in a great way to reach many lives there. Through him, the Lord has given us a number of opportunities to preach in their chapel service. This last Wednesday was one of those times when we were invited to go and minister. We took time before God to seek His heart for these young adults’ lives. The more I prayed, the more the burden of God grew in my heart. There were moments I could see their poor souls under the claws of the evil one. The whole Church was diligent in their prayers for this time of ministry. It was clear we would not enter a strong man’s house and spoil him of his good easily; we needed God. It is God who causes us to triumph and through us diffuses the fragrance of Christ. Mzee Yatich (one of our deacons) and Emmanuel (a young man who joined us from the college) went with me. Mzee Yatich is mighty man when it comes to outreach, always in the forefront. Our hearts were moved to see everyone who came – about 200 students and most of the staff. This is one of the top colleges in the country and they are normally very busy. More than that, the director of the college was also present for time of the Word. I shared on deception and the need to know the Word of God. We knew the Spirit of God was dealing with hearts, because there was no movement in the room, except for one or two of the students. After sharing, one young lady came to Mzee under much conviction and told him that she did not want to go to hell and was ready to surrender to Christ. Others came and shared how thankful they were, including the director, who was fixed on our words the whole time. We are so grateful for the open door, we continue to weep for the souls of the young people and believe that Father will draw them to Jesus. Glory be to the Lord! This entry was posted in Calvary Temple Missions and tagged Calvary Temple Missions, Calvary Temple Sterling VA, Kenya Missions on February 2, 2015 by Pastor Forbe Carlson.